The value of a Tally system is one you appreciate after you've done a few scripted multi-camera events with camera operators and talent. 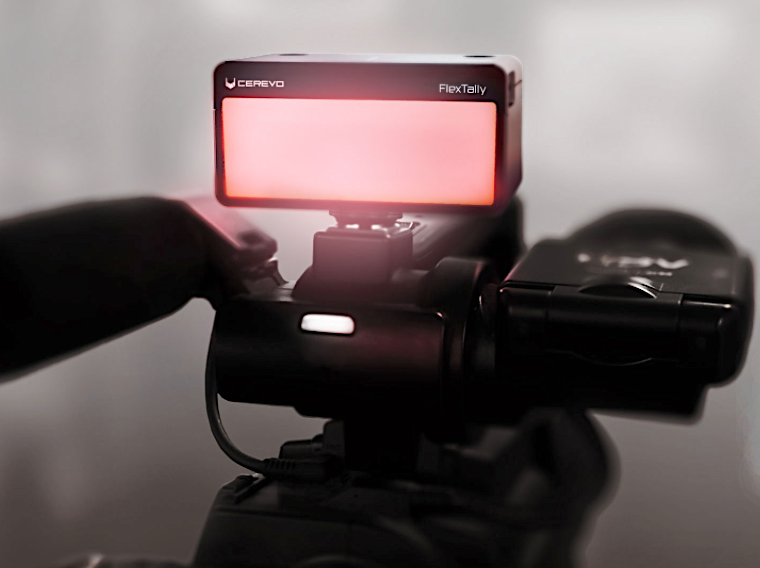 Whether the video is recorded or streamed, having everyone know for sure when a camera was live, which camera to look at, etc, is what a tally system does by shining a bright red light over the active camera. Blackmagic Design has an innovative system that sends tally—and even communications—back to the camera on the same SDI cable the camera is using to send video to the video mixer. There is no dedicated camera control unit any more. Blackmagic's “decentralized” system means you can run a software or hardware camera control panel if you want. This is very economical and flexible. But if you're not using Blackmagic cameras with a Blackmagic mixer, or are using some other system, perhaps with wireless cameras, tally becomes much more of a challenge. 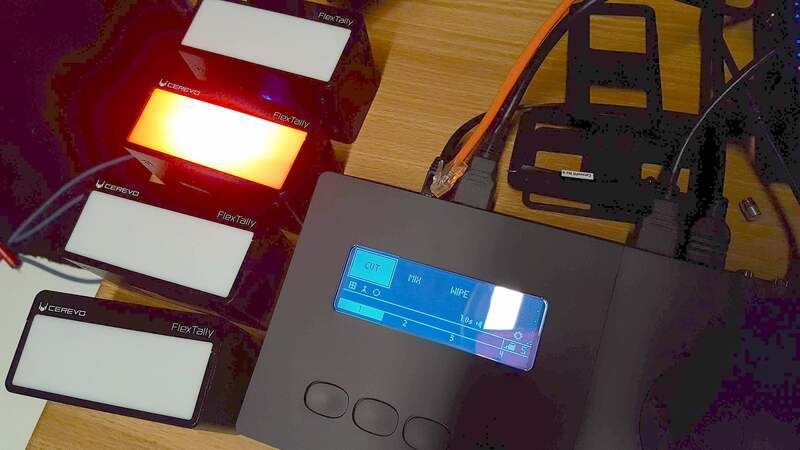 At NAB I saw Cerevo showing off the company’s battery-operated, wireless FlexTally system in their booth and I asked them to send a loaner for me to look at. I've reviewed Cerevo hardware before—specifically, the company’s LiveWedge 4-input HDMI video mixer that can also stream or record (but not both at once). It's a svelte little unit that has minimal surface controls, but a connected Android tablet can get you more capability, easier access to all the settings, and even an audio mixer, for under $1,000. 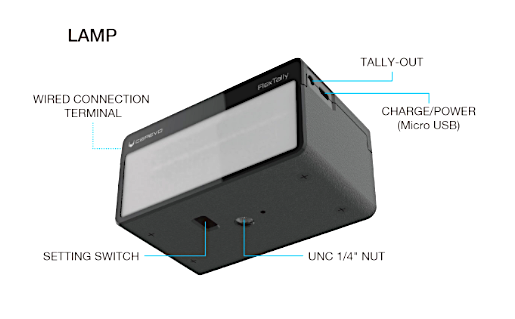 Their FlexTally (Figure 1, below) is a package of 4 "Lamps" and a "Station" unit you connect to your video mixer via Ethernet. It works with the LiveWedge (of course), but Cerevo says it also works with other video mixers as well. The Cerevo website has instructions for networking the FlexTally with Blackmagic and TriCaster mixers. The TriCaster is something I was more interested in, as I own a TriCaster, and have used it with wireless NDI cameras. How do you get tally on a wireless camera? NDI can carry a tally signal, but does the device on NDI have a way to actually show the tally? On a recent shoot, I added two cellphones to my four wired cameras. The cellphones were running the NDI app so they were available to me as cameras 5 and 6. But there was no way for the talent to know when I was on that little phone tucked into the corner of the room for a "behind the scenes" view of the production. This is where a wireless tally system would really come in handy. You may not need it on every input. Some cameras may have an integrated tally. But you can add it where you need it. This indeed makes it very flexible. 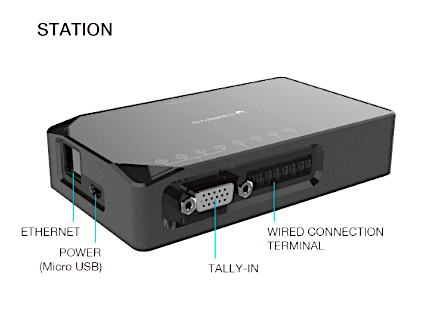 The FlexTally Station (Figure 2, below) is a small box with ethernet and power (USB 5v) ports and a series of lights across the top. I'm told that it operates around 433 MHz so it's not going to interfere with, or be interfered with by, WiFi or wireless video signals on the 2.4 GHz band. The Lamps themselves (Figure 3, below) have 6-12 hour internal batteries (depending on brightness) that charge with a micro USB connection. On top there are two flat buttons and a thin bar of clear plastic. Holding the bottom-left button down for a few seconds lights up the thin bar with a blue LED showing the device is powered up. Underneath the Lamp (Figure 4, below) there are a series of very tiny dip switches that, using binary on and off, allow you to designate the number of the camera you'd like a particular unit to light up. If you want 1, you push the first one up. 2 is the second one up, the first one back down, 3 is both up, etc. 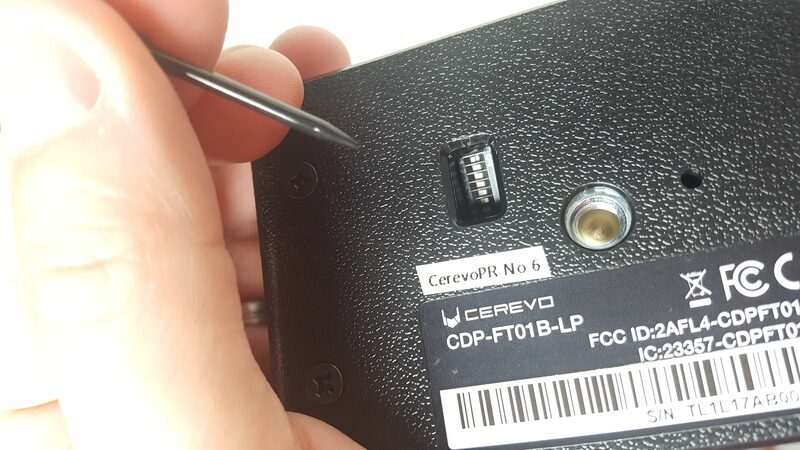 Thankfully, Cerevo provides a hard, fine-tip pointer to help you adjust those little switches. The other flat button on the top of the Lamp (Figure 5, below) is for adjusting the brightness of the red tally indicator (front and back) in four brightness settings. In the video, you can see the brightest of them you can see illuminate my face in a room with the lights on, so it's pretty bright. Put it in a darkened studio and it will certainly stand out. Figure 5. The flat, round button on the left powers the unit on; the button on the right is for adjusting tally indicator brightness. If you need to power them for long running time, you can provide 5V USB power to the micro USB port on the unit. There's also a wired connection that’s helpful if, for some reason, the wireless has issues. Lastly, there's a set of silicone front covers which have a Figure 8 cut-out in the middle so you can remove pieces to provide a visible number for the camera. It's more visible when the tally lamp is illuminated. But even with just the white plastic behind it, it should still have enough contrast to work reasonably well. However, there's not much of a lip on the silicone pieces I received, so in testing they constantly just slid off the front of the tally lamp. The system is designed to handle 16 tally lights, and there's only one digit in the silicone, so after number 9, you're out of luck. In the end, you can probably do just as well with a clear layer of packing tape and then a thick black magic marker writing the number of the tally. With the Cerevo LiveWedge, the network connection worked beautifully (Figure 6, below). You can see this in the video. 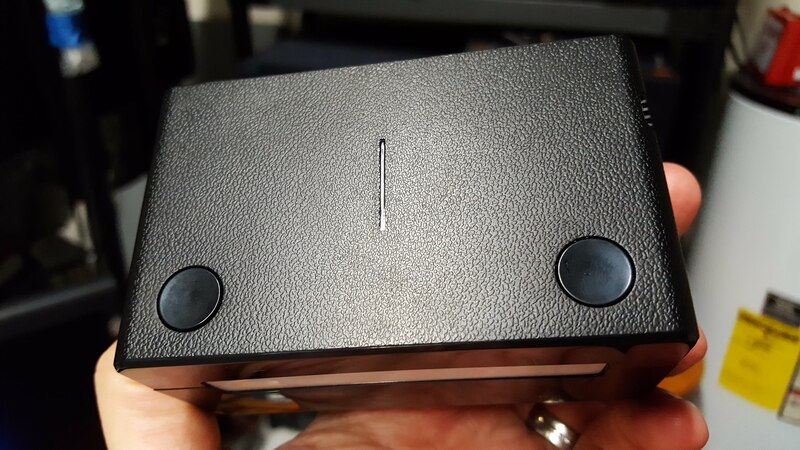 The FlexTally also has an RS-485 port for a GPIO wired connection to almost any video mixer that has hardwired tally support. If you're looking to add a third-party tally to an existing system, there are only a few options available. The FlexTally is flexible, extensible, and wireless. For situations like mine where my TriCaster Mini lacks any physical tally port, finding a solution that can work over ethernet, and then wireless to the tally lighs themselves is a good solution indeed. With the ability to run 16 tally lights, the Cerevo can easily handle the needs of most small-to-midsize productions.